Palestinian Authority chief negotiator Saeb Erakat laments formation of nationalist-religious government. 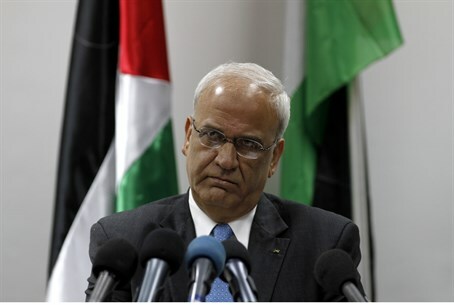 Senior Palestinian Authority official Saeb Erekat has lamented the shape of the new Israeli government, claiming that it "will be one of war which will be against peace and stability in our region." "This government will set its sights on killing and reinforcing settlement activities," he told AFP, referring to Israeli construction in Jewish communities in Judea and Samaria. Erekat, who is the PA's Chief Negotiator with Israel, made his remarks after Israeli Prime Minister Binyamin Netanyahu managed to hammer together a coalition just ahead of a midnight deadline, giving him a knife-edge majority of just one seat in the Knesset. The government was finalized Wednesday night after Netanyahu reached a deal with Jewish Home leader Naftali Bennett, who is adamantly opposed to further concessions to the PA. The 61 MK coalition of centrist Kulanu, nationalist Jewish Home and haredi UTJ and Shas has provoked anger on the Israeli Left as well, particularly over Jewish Home MK Ayelet Shaked securing control of the Justice Ministry, traditionally a bastion of the Left. After all-night talks on the remaining details, Likud and Jewish Home signed a final coalition deal on Thursday morning. But speculation persists that Netanyahu may seek to expand his coalition further by including the leftist Zionist Union party - a move which could prompt the Jewish Home to bolt the coalition.